For the next few weeks, my posts will all be pre-scheduled. I hope to be back online sometime in mid October. So with that said....It's time for another Sentimental Sundays Challenge!!! As you can see, I chose to go with cream and browns as my monochromatic colors. I couldn't wait to use these dies when they arrived in the mail. So there you have it, short and sweet!! Make sure to visit the rest of the team and beauties they have created. 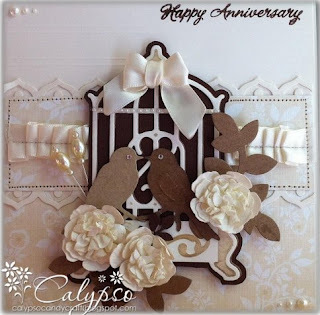 Fabulous idea with the love birds for an anniversary card! Love the monochromatic color scheme! I'm so happy you shared it with us at Papercraft Star! 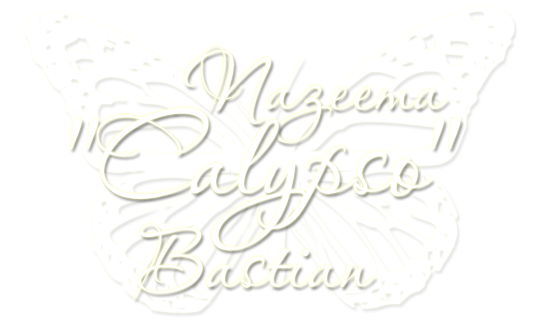 Calypso, I've seen your work on other challenge blogs, and am thrilled you have joined us over at the Papercraft Star this week!!! This card is stunning! The monochromatic colors look so elegant! Yay! Long time, no see. I know you've been so busy these days, but it's so fun to see you playing along with us at Papercraft Star. Love your little anniversary card. I love the brown and white combination. Perrrty! Thanks for playing our embossing challenge at 4 Crafty Chicks! WTG! Stunning monochromatic card. Love how you used the embossing. Thank you so much for sharing it with us at 4 Crafty Chicks. This gorgeous Calypso! Love the elegance of this! Thank You so much for joining us at Dutch Dare this week. Oh this is so pretty! I love the design and all the gorgeous details. OMGness! This is beautiful. Love all the different elements you've included. The birds, the flowers, the ribbon! Excellent. Thanks for joining us at Little Miss Muffet Challenges. Absolutely GORGEOUS!!! Love all the detail on your beautiful Monochromatic card!!!! Thanks for playing the Bring Back Beautiful Challenge!!! 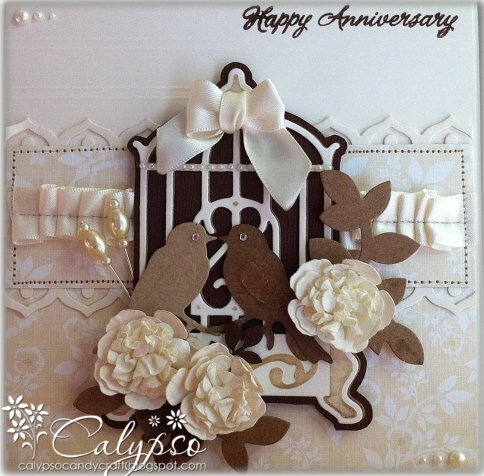 Beautiful card Calypso! I love the monochromatic colour scheme you have chosen and the layout is just lovely! Oh wow, so pretty. Love all the different textures. Thanks for sharing it with us at Catered Crop.